A baby Bottlenose Dolphin swims besides her mother on a dolphin watching tour off the North Island of New Zealand. Dolphin watching off the North island of New Zealand is very thrilling but even more so when you get to see a baby Bottlenose Dolphin swimming close to its mother. 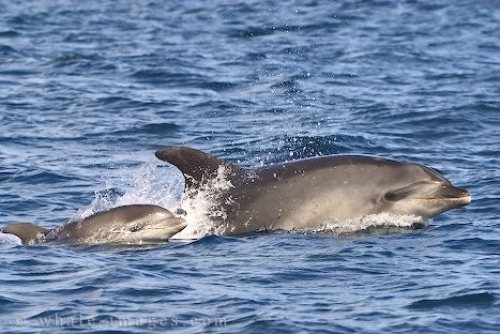 The number of baby Bottlenose Dolphins along the New Zealand region seem to have been declining over the years for unknown reasons, so it is very exciting to see a baby with its mother. The Bottlenose Dolphin is one of the most common dolphins seen around New Zealand as they are found along all the coasts. The females breed between three to five years and each baby will feed off their mother for about eighteen months but some for up to three years. The mother dolphin stays close to her baby when swimming so that she can keep a close eye on her baby. A mother Bottlenose Dolphin needs to teach her offspring many different traits as it grows especially feeding techniques. It only takes a few days for a baby to learn to vocalize and begin to socialize with other Bottlenose Dolphins but other characteristics develop as the baby ages. Photo of a mother Bottlenose Dolphin swimming with her baby in the waters off the North Island of New Zealand. A Bottlenose Dolphin can grow to be about 3.5 meters long and live in pods that range anywhere from about two to sixty animals. When the baby is fully grown it can weigh anywhere from about 250 to 650 kilograms and their lifespan can be forty years or more. Around the Bay of Islands in New Zealand there are about 450 Bottlenose Dolphins but they move around from Northland to Tauranga depending on the time of year. Sometimes the Bottlenose Dolphin is found farther out in the waters and at other times they are fairly close to shore but they are not known to regularly mix with any other species. While visiting the North Island of New Zealand, be sure to venture out on a dolphin watching tour and see for yourself what these fascinating and energetic mammals are like in their natural environment. New Zealand, North Island, Bay of Islands, whale watching, dolphin watching, bottlenose dolphins, "Tursiops truncatus"